Maria Paola Tomasino graduated in Environmental Biology at University of Bari, Italy and obtained her PhD at Tuscia University, Viterbo, Italy. She had a post-doc position at Stazione Zoologica Anton Dohrn of Naples, where she starts to study marine microbes. She applied molecular methods, in particular DNA metabarcoding, to characterize phytoplankton community and species abundance patterns across temporal and spatial scale. 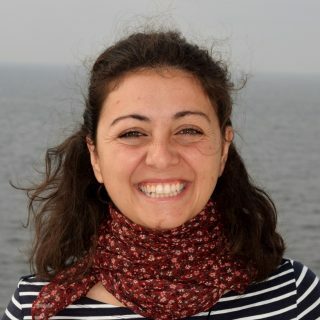 She currently has a research grant at CIIMAR (Interdisciplinary Centre of Marine and Environmental Research, University of Porto) exploring the biodiversity and the ecological function of eukaryotic and prokaryotic plankton in the oceans, through the next-generation sequencing technologies. Maria Paola has always been interested in outreach and education activities, particularly via science communication at schools, science festivals and more informal settings. She was involved in different citizen science initiatives, promoting collaboration between scientists and the general public. As part of the cruise Maria Paola will work together with the Biological/Biogeochemistry team, and will collect water samples for genomics/metagenomics, biogeochemical analysis and phytoplankton identification to gadder sufficient data to understand the biological/biogeochemical gradients across ocean fronts.